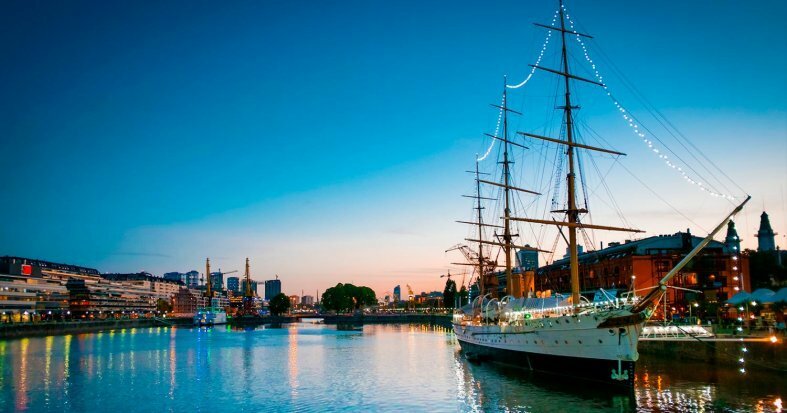 Travel to the land of the tango and explore the elegant neighborhoods and exquisite cuisine of Buenos Aires. 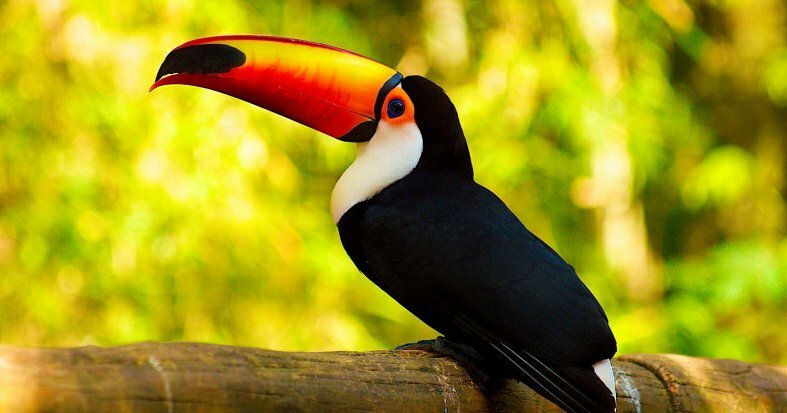 Fall in love with the landscape of the Iguazu Falls. 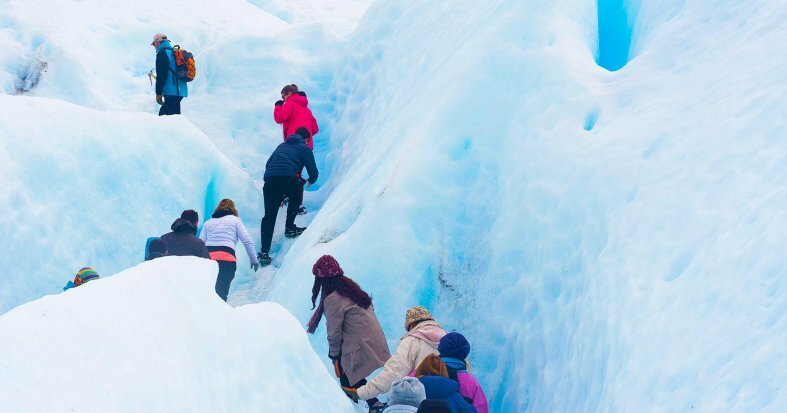 Discover exciting Patagonia and enjoy the famous ever-changing icy glaciers of El Calafate before enjoying the rhythm of vibrant Rio de Janerio. International flight U.S. - Buenos Aires - Rio de Janeiro - U.S. Train ride to the Garganta del Diablo(The Devils Throat). Transfers in vehicles with air conditioning. * Documentation of the internal flights will be available in the "My bookings" section in your "Private Area" 7 days after you have made your booking.It is essential to fill in the passport information correctly for each passenger in the given boxes at the end of the reservations process. Maximum checked baggage limit on internal flights is 15kg. IMPORTANT: Check with your doctor's recommendation for vaccines to travel to Brazil. IMPORTANT: It is mandatory to send a copy of the valid passports of all passengers to customerservice@exoticca.com once you have made your reservation. Tourist Tax (Ecotasa). Park Entrance Fees - approximately $53, drinks, tips and anything not mentioned in the Price Includes section. Arrival at departure airport ready to check-in for a flight to Buenos Aires. Overnight flight. 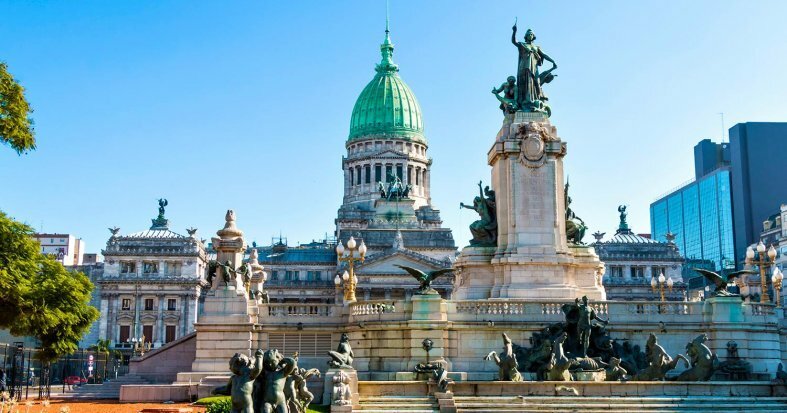 Arrival in Buenos Aires*, transfer to the hotel and the rest of the day is free for you to explore this sprawling city, full of colonial architecture and vibrant culture. Overnight in Buenos Aires. *You can book Early Check-In in the next step of the booking process. Breakfast at the hotel. 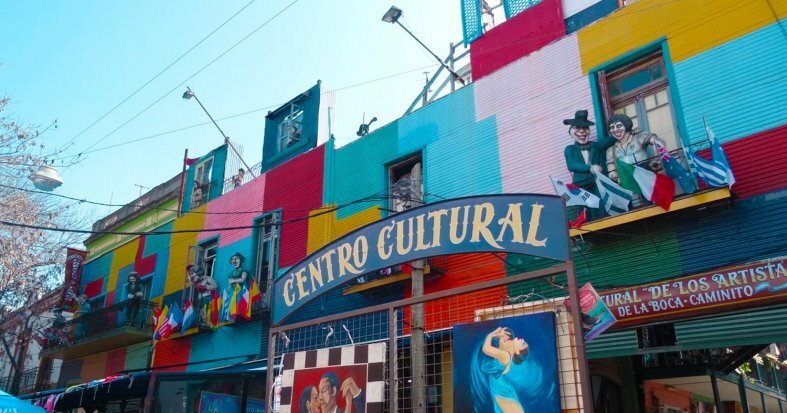 Today, enjoy an included tour of the chic city of Buenos Aires. 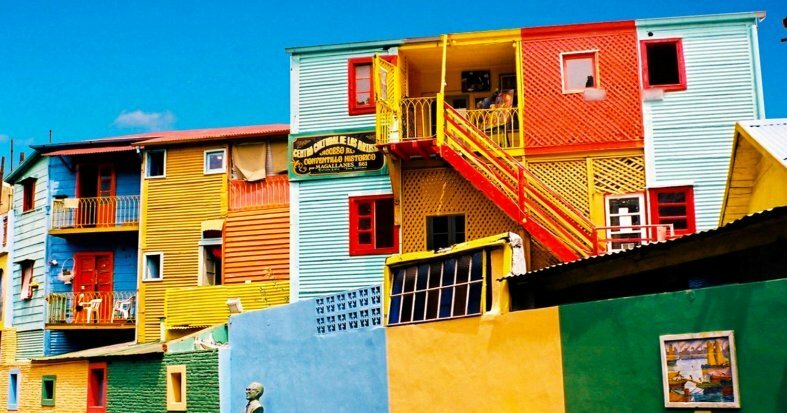 Visit the most emblematic sites and monuments of the capital, such as the Plaza de Mayo filled with soul and history, the picturesque district of La Boca, the Obelisk representing the symbol of the Argentine capital, or the Casa Rosada where the artist Madonna performed the hit song "Do not cry for me Argentina" in 1996. Night at the hotel. Breakfast at the hotel. Free day. Take advantage of this day to continue to discover the capital and soak up the local atmosphere, and the architecture of the colonial buildings and the delicious cuisine. Night at the hotel. Breakfast at the hotel. Transfer to the airport for a flight to El Calafate. Transfer to the hotel and night at the hotel. Breakfast at the hotel. Depart for the Glacier National Park, a UNESCO World Heritage Site, covering an area of 1,482,632 acres. 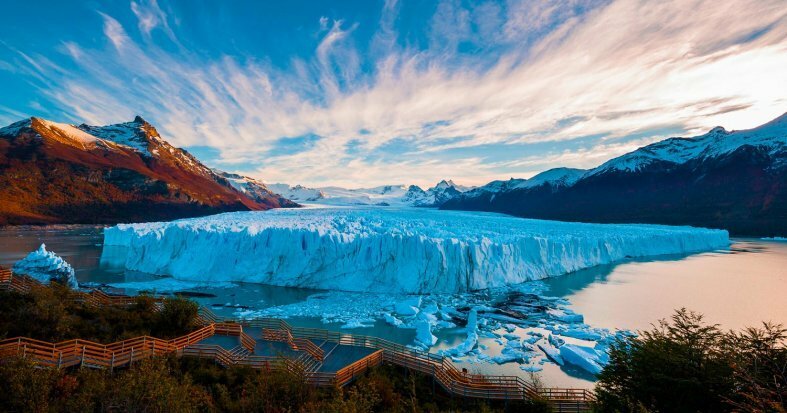 Marvel at this majestic Patagonian Ice Field and its famous natural wonder, the Perito Moreno Glacier. 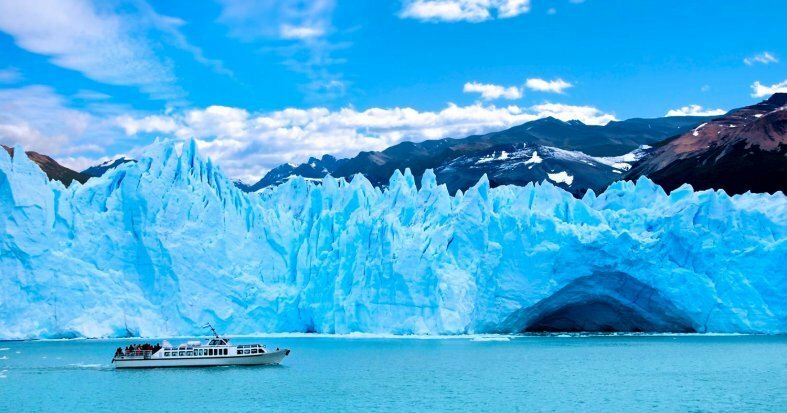 From Puerto Bajo Las Sombras, navigate to the Perito Moreno Glacier on the waters of Lake Rico. Once in front of the impressive wall of ice, the boat stops a few minutes to appreciate the landscape in more detail. Night at the hotel. Breakfast at the hotel. Spend the day at your leisure. We suggest the excursion to the Upsala Glacier, one of the largest glaciers in the southern hemisphere. * Make the most of the area that includes extraordinary natural glaciers, beautiful lakes and soaring mountains. Night at the hotel. *Optional excursion: Glaciers Cruise Maria Turquesa: Board the boat at Lake Argentino, and head northwest where you will visit Escuadra Bay, Condoreras Wall and there are more than 200 of magnificent glaciers which highlights the Spegazzini Glacier, with a height of 443 feet; and also, the Upsala Glacier, with a extension of 295 square miles. Navigate through Los Tempanos Channel for a unique view of this wonder. The excursion includes a lunch box onboard. The ice field of Patagonia, after Antarctica is the largest ice sheet on the planet. Glacier National Park is a magnificent scenery of forests, icebergs, mountains, and lakes with more than 200 glaciers. Price per person $130. Breakfast at the hotel. Transfer to the airport for a flight to Iguazú. Transfer to the hotel and night at the hotel. Breakfast at the hotel. Visit the Argentinian side of Iguazu Falls by taking the train to the 'Devil's Throat' where an lookout area grants the opportunity to watch the water rush from the river and down an 262 feet high sheer drop. Walk across bridges and enjoy the panoramic views on offer. Hear the roar of water whilst taking in the spectacular views of rainbows, birds, leafy green exotic plants and trees. * Return to the hotel for an overnight stay. Breakfast at hotel. 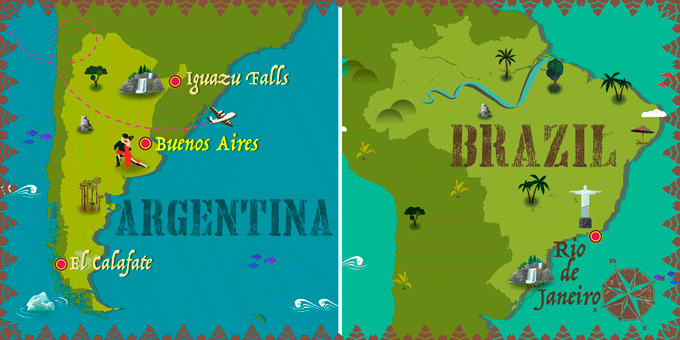 Visit the Brazillian side of the Iguazu Falls, one of the world's Seven Natural Wonders. Walk on the trails and enjoy a spectacular panoramic view of one of the biggest waterfall systems in the world. Overnight stay. Breakfast at hotel. 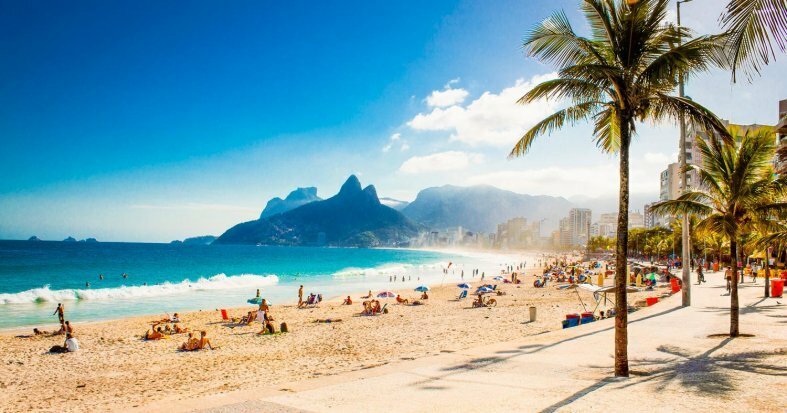 Transfer to the airport for a flight to Rio de Janeiro. Transfer to your hotel and the night in Rio de Janeiro. Breakfast at hotel. 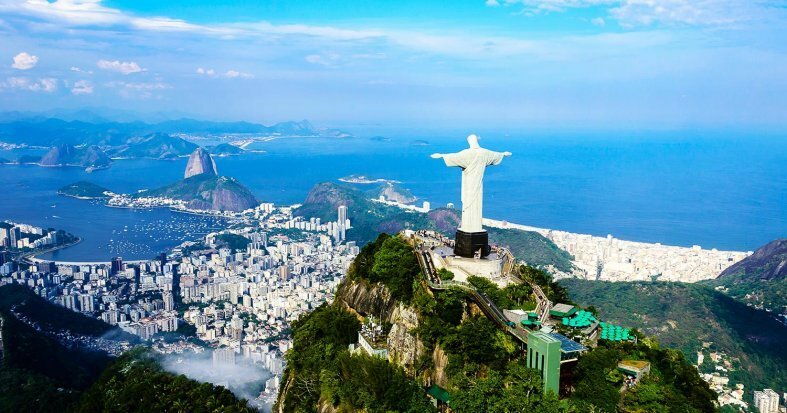 Spend the day taking an included city tour of wonderful Rio, which includes a trip up to the famous Christ the Redeemer statue.Visit the famous Corcovado mountain, one of the Seven Wonders of the Modern World. Christ Redeemer is more than 2,296 feet in height and dominates the city's skyline. 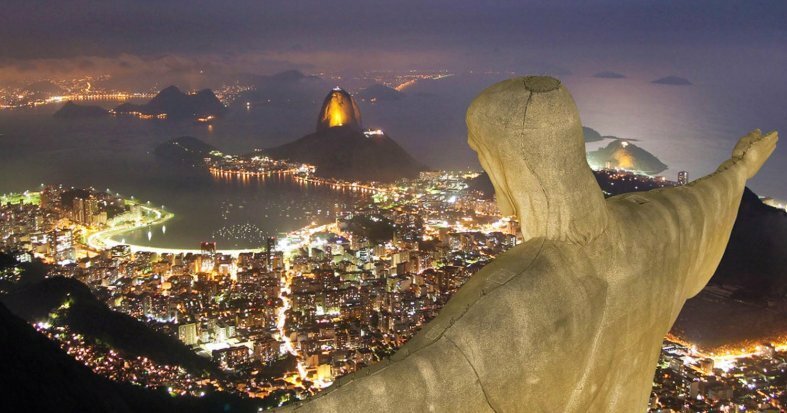 Admire the iconic Christ the Redeemer; an immense rock statue built by the sculptor Francés Paul Landowski. Descend from the hills to enjoy a visit to Maracanã and a visit to the Sambódromo, where the Rio Carnival takes place yearly. Also, visit the famous Selaron Steps. Overnight in Rio de Janeiro. Breakfast at the hotel. 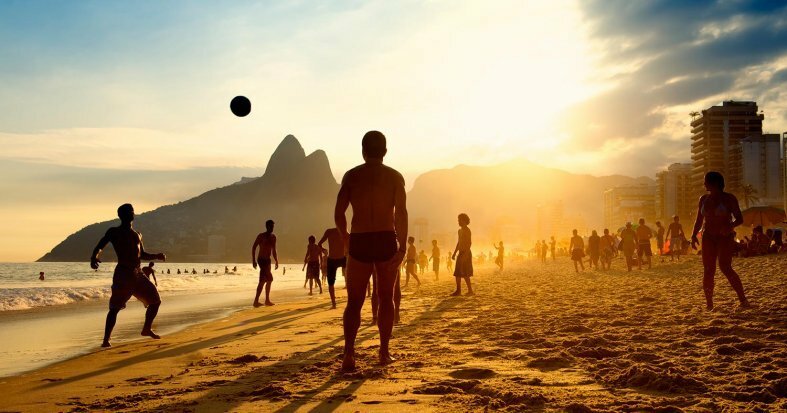 Enjoy a free day to discover all the wonderful delights that Rio has to offer. We recommend an optional excursion to Sugar Loaf Mountain for a great view across the city. * Overnight stay. 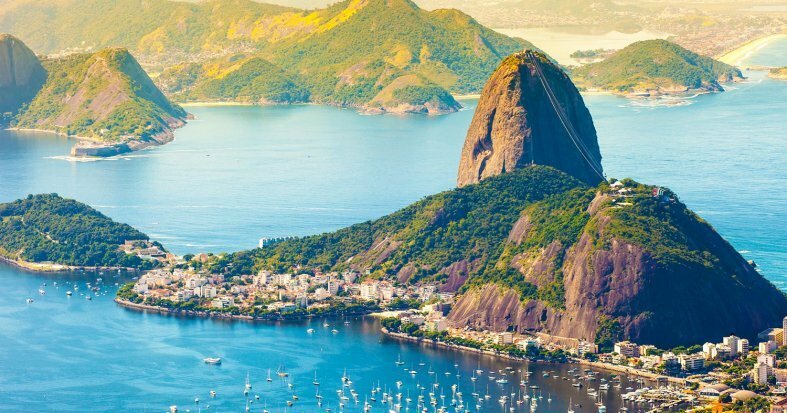 *Optional Excursion to Sugar Loaf Mountain, the Selaron Steps & Metropolitan Cathedral: Enjoy an informative tour of downtown Rio before stopping at the Metropolitan Cathedral, built in a pyramidal shape and the seat of the Roman Catholic archdiocese in Rio. 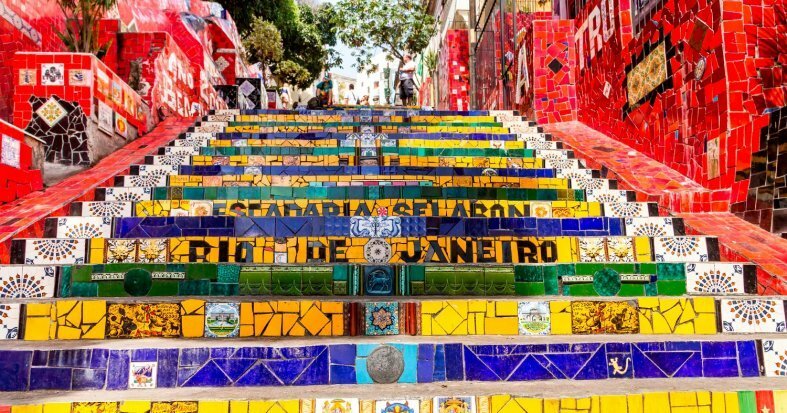 Next, admire the colorful Selaron steps and head for the neighborhood of Urca where one of the largest symbols of the city is located: Sugar Loaf Mountain. Travel to the top on a cable car and enjoy the spectacular views of Rio-Niterói Bridge and Corcovado Mountain. 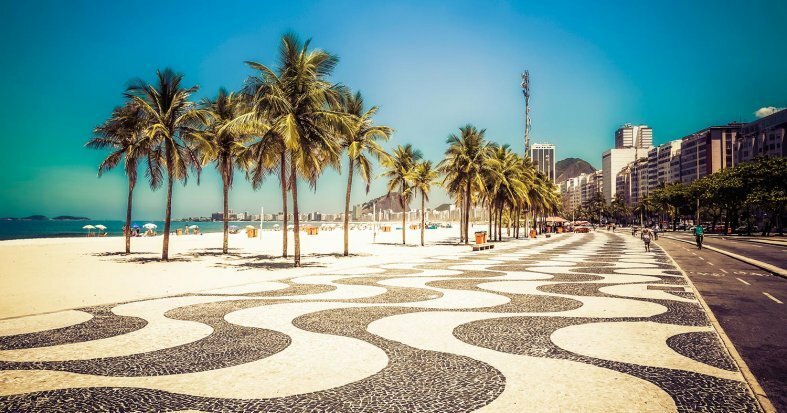 Look down on Copacabana beach, the Santa Cruz fortress and several beaches of Niterói and be amazed at the sheer beauty and diversity of the Rio skyline. Price: $70 per person. Breakfast at the hotel. Transfer to the airport for the flight back to the U.S.
*Depending on your departure time your flight may arrive one day later to the U.S. Transfers in vehicle with air conditioning. reakfast at the hotel. Spend the day at your leisure. We suggest the excursion to the Upsala Glacier, one of the largest glaciers in the southern hemisphere. * Make the most of the area that includes extraordinary natural glaciers, beautiful lakes and soaring mountains. Night at the hotel. Domestic flights Buenos Aires- El Calafate- Iguazú Falls - Rio de Janeiro*. Breakfast at the hotel. 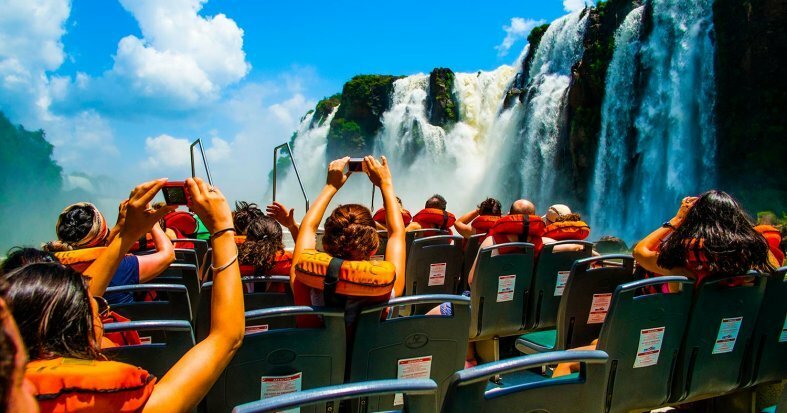 Visit the Argentinian side of Iguazu Falls by taking the train to the 'Devil's Throat' where an lookout area grants the opportunity to watch the water rush from the river and down an 262 feet high sheer drop. Walk across bridges and enjoy the panoramic views on offer. * Return to the hotel for an overnight stay.